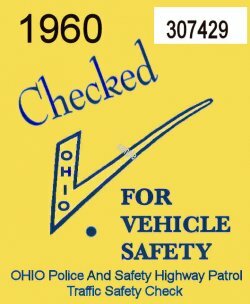 1960 Ohio Safety Inspection Sticker - $20.00 : Bob Hoyts Classic Inspection Stickers, Add a Final Touch to your Restoration! This 1960 Ohio Safety sticker was carefully restored both front and back keeping true in color and size to the original. It has our patented "Peel and Stick" format which allows you to place it on the inside of your windshield. There are safety inspections dating back to 1946. These sticker were used by car dealers and were issued at roadside check points to vehicles that passed inspection.